What: Today’s recipe is an easy way to make Mac & Cheese just as quickly as you can out of the box. No baking necessary. A stovetop is all you’ll need. When: Have extra cheese on hand? Whether you’re looking to get creative with leftover ingredients or simply want to skip the pricey boxed Macs, Homemade Instant Mac & Cheese is really a no-brainer. Why: Right or wrong, thousands of parents across the country were shocked into despair a few weeks ago upon reading a bombshell report that their favorite foolproof shortcut kids’ meal, boxed Mac & Cheese, may have one of the highest concentrations of Phthalates (harmful chemicals found in plastics or, in this case, which migrate to high fat food from the manufacturing line). Though the veracity of the study is being debated (it wasn’t peer reviewed, for one, and there is debate over what constitutes acceptable levels of Phthalates), parents like myself who’ve been judiciously avoiding phthalates in toys and and plastic containers (to say nothing of BPAs), are probably more likely to err on the side of caution until more details emerge. Even for those already conscious of making “healthier” choices when it comes to our favorite “junk food,” the worst news was that even trusted organic brands were not immune from Phthalate contamination, particularly within the powdered cheese packet. How: The trick to this recipe involves reserving some of the hot pasta water to create a sauce – you’ll dissolve slices of cheese in a small, microwave safe bowl, to create the creamy cheese sauce – you won’t even have to add Milk if you don’t want. All this comes together in nearly exactly the same amount of time as you’d need for the boxed version. Other bonuses include far less sodium (which may take your kids a bit of time to adjust to) and more opportunity for creativity! Play around with different Cheese blends and healthy mix-ins. My usual M.O. is to add frozen Peas and Carrots to the cooking pasta just a few minutes before it is done. The Veggies with thaw and warm right in the same pan, then you can drain the Pasta and Veggies and add the cheese. Guilt-free Mac & Cheese here you come. Check out the easy method below! Set a pot of salted water to boil and the prepare Pasta as directed on the package, adding Organic Frozen Peas & Carrots about 3 minutes before pasta is done. Before draining, reserve about a 1/3 cup Pasta Water in a small, heat proof and microwaveable bowl. Drain Pasta. Return it to pot. Place about 3 Slices of American Cheese, Mild Cheddar, or a blend of similarly textured sliced cheeses. They should melt into the water with a little stirring, or if not, give them a quick zap in the microwave (30 seconds to start). Stir to desired consistency and if the water looks too much for the amount of pasta you have, drain some off the cheese mixture. Stir Cheese Mixture into the Pasta and combine to coat. If the mixture is too thin, add a few pinches of Flour or Potato Starch to thicken. Taste for seasoning and add Salt if needed. Add a pat of Butter to enhance flavor and texture. What: An easy layered pasta casserole that’s packed with veggies, and you won’t have to turn on the oven. Why: Because you should never miss an opportunity to get your little ones used to greens. 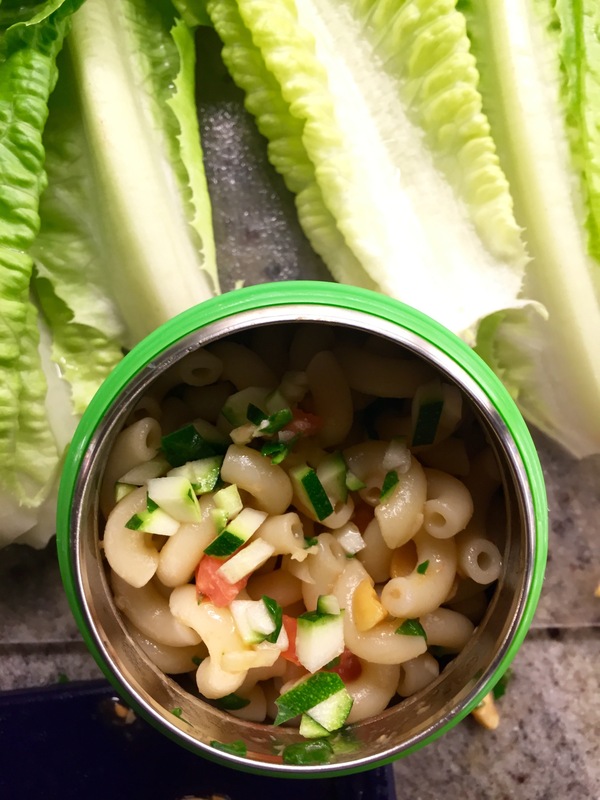 I like this dish because it incorporates vegetables without trying to hide them – it’s the same idea as our Mac ‘n Greens from a few weeks ago. How: Slightly overcooking the pasta and assembling it while hot helps bind this casserole together. I recommend using small glass Pyrex covered dishes to store or freeze in several portion increments. In a food processor, blend Spinach Leaves and Broccoli with the Olive Oil until finely minced. The results should be a spreadable paste, loosen with a little water if needed. Set aside. Prepare the Orzo in Salted boiling water, according to the package instructions. Cook an extra two minutes over recommended time. Drain. To prepare, press a half inch of Orzo into the bottom of a glass container. Top with a thin layer of the Vegetable Mix. Sprinkle with Pecorino. Repeat, adding another layer of Orzo, Vegetables, and the Pecorino Romano. Dot the top of the casserole with the bits of Butter, pressing into the surface so that Butter Melts. Allow casserole to set in the fridge at least a 15 minutes before scooping out portions with a spatula or spoon. Warm in the microwave or heat the glass serving dish before portioning. Classic Mac and Cheese gets a greens infusion. Be happy giving them what they want! Pasta is our go-to because our little guy loves it all the time. At 15 months, I think he prefers things he can grab with his little hands, and the fun shapes (remember how you used to love wagon wheels?) and colors don’t hurt either.